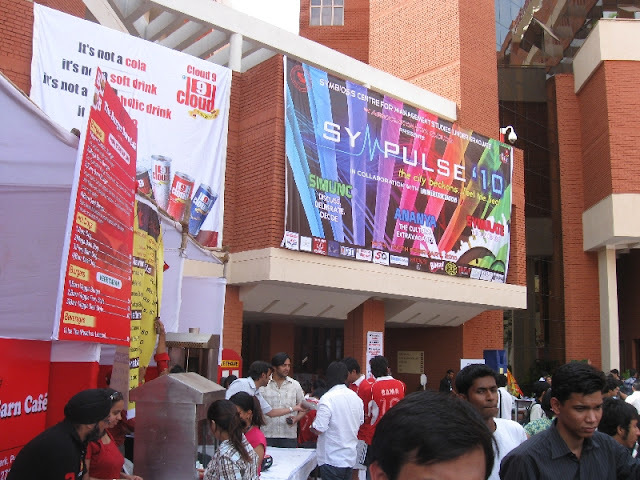 On Wed 17th Feb and Fri 19th Feb 2010, Wake Up Pune volunteers joined the Wake Up Pune–Take 10 team to staff the kiosk and do outreach at the Sympulse 2010 event at Symbiosis Institute of Media and Communication (SIMC), Viman Nagar Campus. The WUP–Take 10 satellite uses a very effective 10-question questionnaire as an outreach tool. 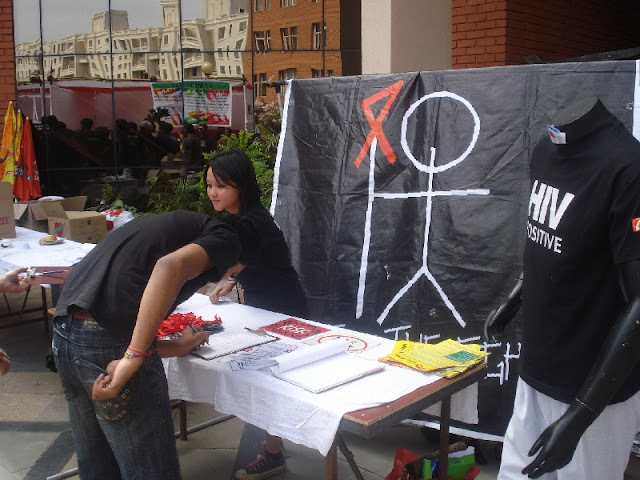 A team of two outreach workers with questionnaires, clipboards, and pens walks through the crowd and asks students if they would like to find out what they know about HIV. Virtually everyone approached readily accepts the invitation and fills out the form. When done, the outreach workers go over the questions and provide the correct answers and answer any additional questions the students have. Over 130 questionnaires were filled out on both days of the event. 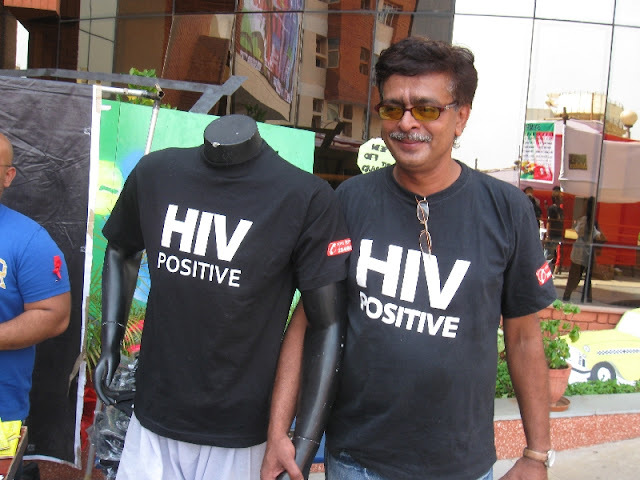 Wake Up Pune–Take 10 workers then tabulate the answers as a way of assessing what and how much is known about HIV by the folks they reach out to. 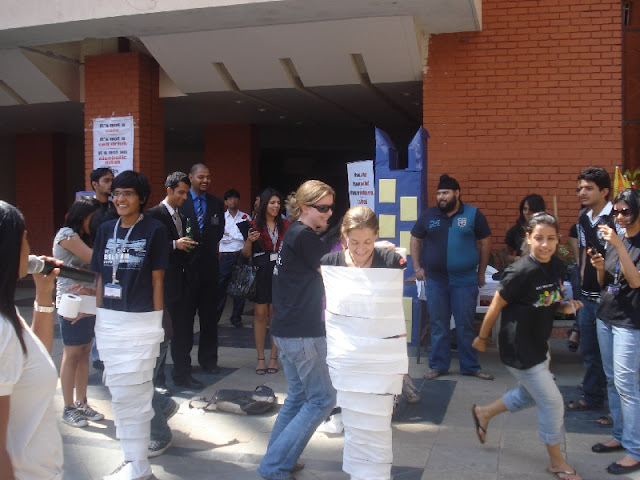 On Wednesday, Emeline Rougeaux and Emma Collingbourne (wearing HIV Positive t-shirts) won one of the “Mummy Making” contests when Emma completely wrapped Emeline in toilet paper faster than any of the other teams. On Friday, 3 volunteers from Japan brought some fun and games to the event, including some origami Samurai Warrior hats made out of newspaper with “HIV Positive”, “Condom Helmet”, and “Use A Condom” messages written on them. “Major Tom”, our new mannequin outreach tool, made his debut at the college and was a hit but unfortunately he wasn’t stylish enough to be invited to participate in the event’s FashionShow on Friday.